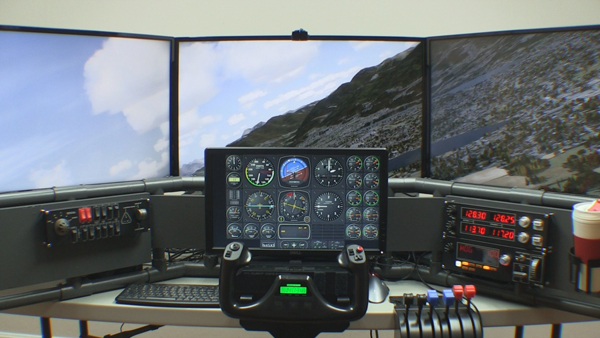 Roger Dodger Aviation’s defining project is probably the Triple Screen Flight Simulator, item #T440. This project has sold well since it was published in 2011. In addition, hundreds of people have flown the sim at the KC Maker Faire and at the National Airline History Museum. I’m proud to announce this DIY project is now available as a online e-learning course. 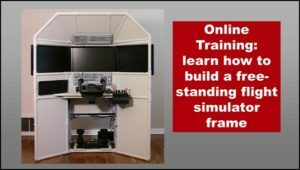 If you already purchased the DIY Triple Screen Flight Simulator project as a download, you will be upgraded to the online course for free. What is the DIY Triple Screen Flight Simulator Update? The new version is the same content, but in an online e-learning format. This means the student sees the video clip, instructions, pictures, and diagrams for each particular step. You no longer have to look through an hour long video or 100 page manual to find something. Furthermore, you can access the course on mobile devices like smart phones and tablets as well as standard desktop and laptop computers. How do You Get the Update? 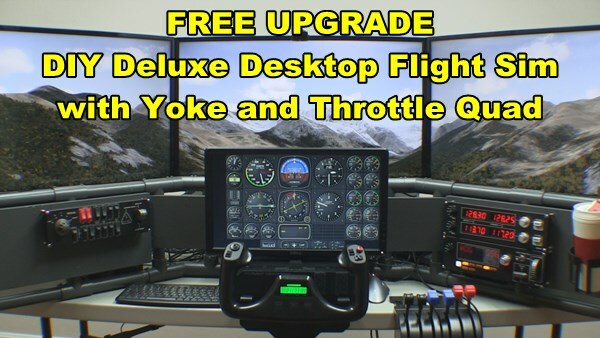 If you’ve already purchased item T440 DIY Triple Screen Flight Simulator, the new update is FREE. 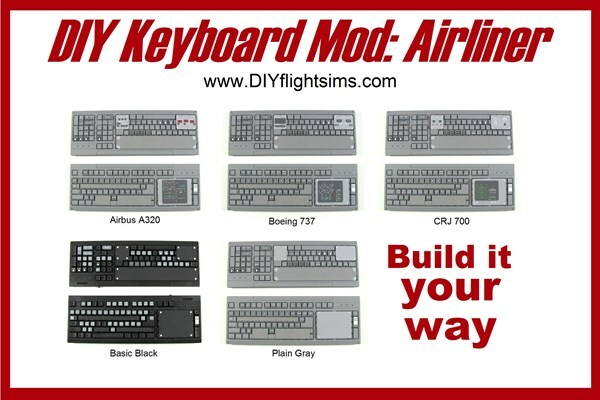 Just email me at DIYflightsims@rogerdodger.net to get the new updated version. In addition, tell me what email address you used so I can look up your order. Then, I’ll send you a coupon code that allows you access to the update for free. Also, you get free access to the Builder Academy where you can learn all the basic skills for building DIY Flight Sim projects. What About the Keyboard Mod? You get it too! The original DIY Triple Screen Flight Simulator project always came with the DIY Airliner Keyboard Mod project, item #K140B. The reason was that it was so easy to install an overhead panel in to this type of cockpit. The keyboard mod is also in an online e-learning format. get the update for free. and smart phones as well as the standard desktop and laptop computers. See the free trial version here. If I had to choose my favorite DIY Flight Sim project, I think it would be the Pod. It’s my only enclosed flight simulator project so you actually enter it like a vehicle. When you take a flight in the Pod, it’s more like leaving on a trip. Plus… it’s big. 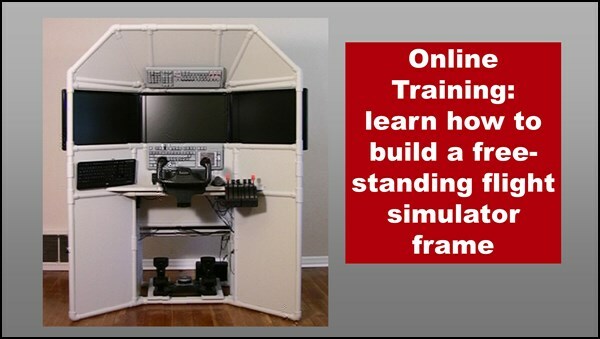 This enclosed flight simulator is more than just a shell packed full of hardware, it also has an attractive exterior. I dreamed about having a flight sim like this for a long time before I had the opportunity to build one. Plus, I worked on the DIY videos, instructions, pictures, and drawings for over a year. Now I can present the entire project to you, step-by-step, so you can build one too. The updated version of these plans are in a new, online tutorial format. This means that for each step of the project you see a video clip and the associated instructions, pictures, or printouts. Recall the original Pod video is over 2 hours long and the manual is 130 pages. The new course is a better, learner-centered presentation. In addition, you can access the course on nearly any device like tablets and smart phones in addition to desktops and laptop computers. This means it’s easy to take the tutorials with you into your garage or workshop while you build. There are a few printout templates, and yes, you can still print them out. You can see a free trial here. 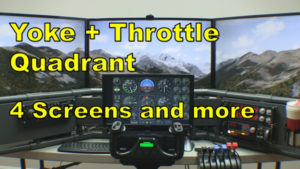 This new online version is FREE if you’ve already bought the E430 DIY Flight Sim Pod enclosed flight simulator course. Email me at DIYflightsims@rogerdodger.net to get your updated version. Be sure to tell me what email address you used when you ordered so I can look you up. Then, I’ll send you a coupon code that will allow you access to the online lessons for free. 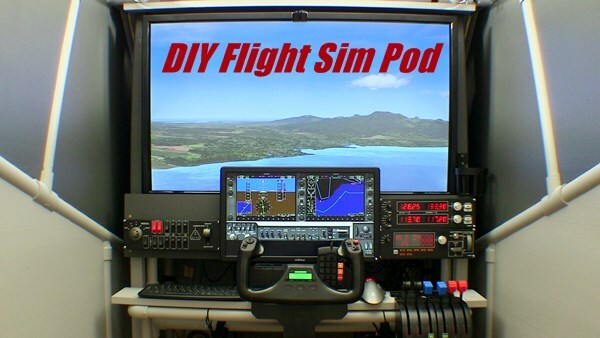 Start the epic journey of building and flying the DIY Flight Sim Pod! The F331 DIY Easy Helicopter Collective is one of my favorite projects because it fills an urgent need in the flight sim community. Try to find a helicopter collective control for a reasonable price. You will not find one, they are all hundreds of dollars. My DIY Helicopter Simulator Controls are still, after several years, the most cost-effective solution for home flight sim pilots. 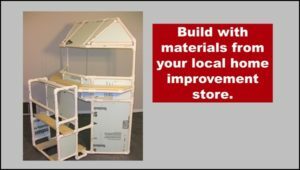 My tutorials show you how to build a framework from PVC pipe. You then attach standard HOTAS joystick/throttle and rudder pedals. The new, upgraded version of these tutorials are completely online and can be accessed with any device. No more cumbersome downloads! How do you get the Upgrade? This new online version is FREE if you’ve already bought the F331 DIY Easy Helicopter Collective. 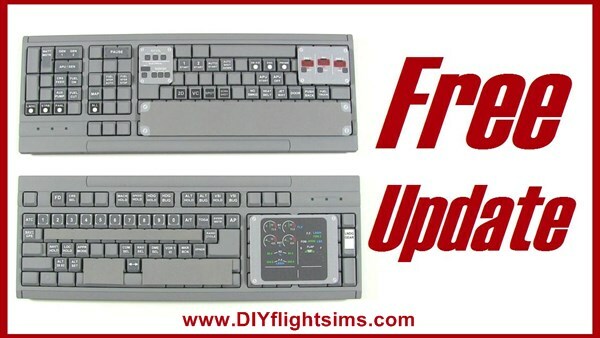 Email me at DIYflightsims@rogerdodger.net to get your upgraded version. Be sure to tell me what email address you used when you ordered so I can look you up. Then, I’ll send you a coupon code that will allow you access to the online lessons for free. 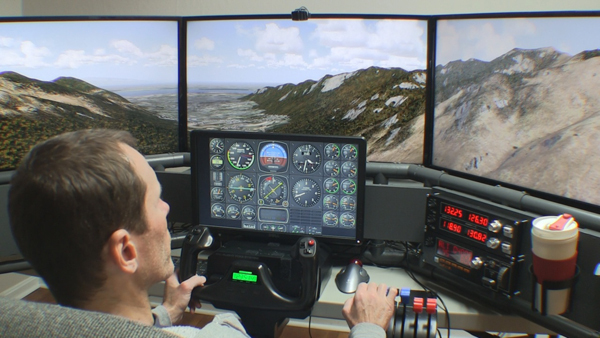 You can then build your own DIY Helicopter Simulator Controls and get flying… and hovering. 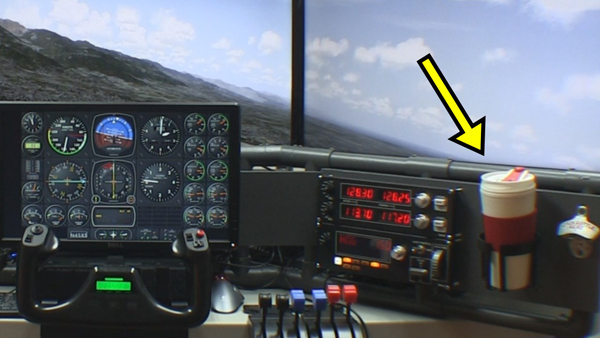 Have you ever tried to fly a helicopter with a regular flight sim throttle? It’s not enjoyable. There is a reason why helicopter controls look different than airplane controls – they ARE different. Once you try a helicopter collective, you will never want to go back to a regular throttle. When you use a collective, the movement is completely natural, you don’t have to even think about the controls any more, just make the helicopter do what you need it to do. I could never hover, or even land a helicopter before I built my collective. Now everything is easier. The F311 DIY Side Joystick Frame project demonstrates how to build a simple and useful DIY HOTAS mount for your flight simulator controls. 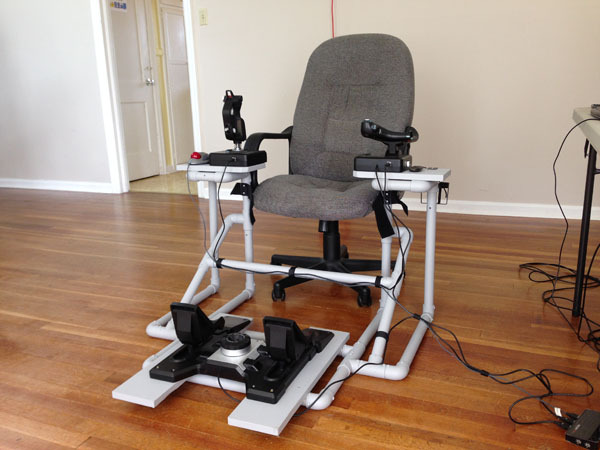 You can attach the joystick, throttle, and rudder pedals to this sturdy framework. Furthermore, you don’t have to modify your office chair or desk! The new upgrade provides more room on the side stands which is especially helpful when you wear a Virtual Reality headset. 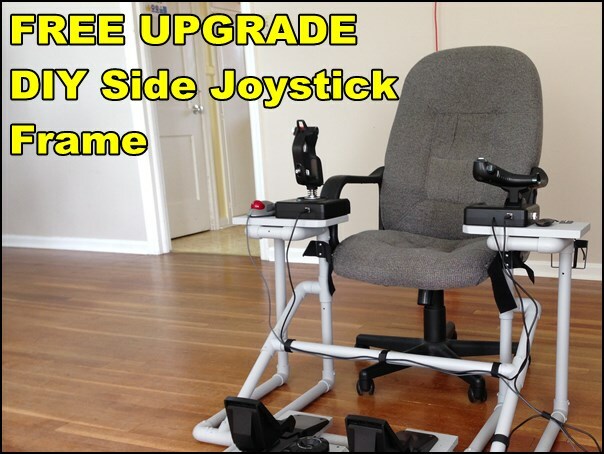 The project upgrade is FREE if you already purchased the F311 DIY Side Joystick Frame. 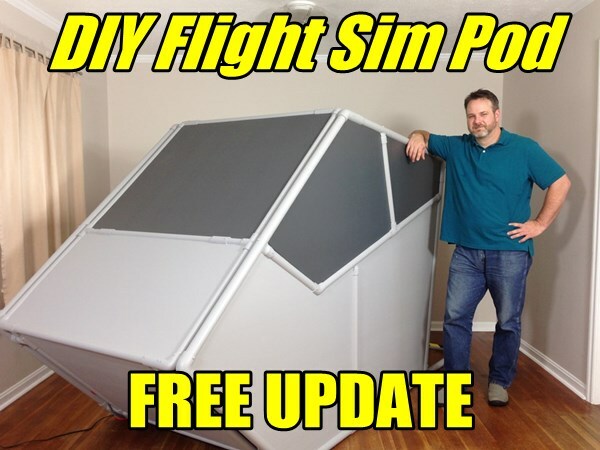 Just email me at DIYflightsims@rogerdodger.net to get your upgraded version. Be sure to tell me what email address you used so I can verify your order. Then, I’ll send you a coupon code that will allow you free access to the project. You can get the updated F311 project here and then access the plans on any device. The F311 instructions are completely online, so you don’t have to download anything. The instructions, streaming videos, pictures, and printouts are all included with this online training course. I realized that I needed to make a few changes to the F311 frame when I tried the Oculus Rift VR headset. Remember, you can only see things inside the headset when you use VR, so it’s difficult to tap a keyboard key or find your mouse. As a result, my solution was to attach a trackball mouse beside the joystick. It’s always in the same place, so I don’t have to look for it. I tested (e.g. played with) this solution for many hours on Elite Dangerous. Even in its original configuration, the F311 Side Joystick Frame works well with many types of flight sim setups. It’s easy to slide the frame under a desk or table, and then roll up to the frame with your office chair. Hold your chair in place with the Velco straps. Remember, you don’t have to modify your chair or desk to use this DIY HOTAS mount. This is a great addition to your home flight sim and works well with Lockheed Prepar3D, X-plane, Flight Sim World, FSX Steam, and others. 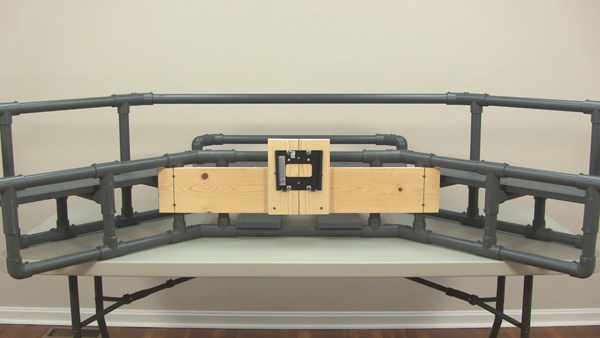 The DIY Side Joystick Frame is one of my most popular projects, and it’s very versatile. Even though I published this project 6 years ago, the design has stood the test of time. Yet, as great as it is, I have recently made a few modifications to the design that you might find helpful for your project. Read on for 5 Modifications for a DIY HOTAS Chair for Virtual Reality and More. The DIY Side Joystick Frame, Item #F311, makes a true HOTAS (Hands On Throttle And Stick) possible for your flight simulator because the project also includes rudder pedals. True pilots use rudder pedals, not joystick twisty grips so always remember that. I originally envisioned the F311 as useful primarily for jet fighter simulators, but now, many customers are using it for space sims like Elite Dangerous and Star Citizen. Use the F311 in combination with a Virtual Reality headset. Remember, when you wear a VR headset, you can’t see your keyboard any more and any functions you have assigned to your keyboard keys are literally out of sight. You can also use the F311 with a traditional multi-monitor setup like the DIY Deluxe Desktop Flight Sim (Item D250). The F311 is delightfully versatile and useful. Use these 5 Modifications for a DIY HOTAS Chair to update the F311. I made five main modifications to adapt the F311 Side Joystick Frame for my current requirements. None of these modifications are difficult. If you can build the F311 in the first place, you can certainly make these modifications or include these changes during the initial build. First of all, I installed wider side stand platforms, cut from 1×8 boards. To be clear, the PVC pipe side stands did not change, just the the boards that attach to the top of the stands. I topped the side stands with 1×8 boards, 12″ long. The wider boards give you room for a trackball mouse next to the joystick and give you room next to the throttle to set down your phone or whatever. Most importantly, you can place the controls in a more ergonomic location. This means placing the joystick and throttle in line with the chair’s arm rests. This is so important! Place the joystick and throttle so that your arms sit straight on the chair’s arm rests. This will allow you to fly comfortably for hours. In addition, I attached the joystick and throttle with wood screws instead of Velcro. I also trimmed the inside corners of the 1×8 boards by 1″ and sanded the edges so my legs wouldn’t get caught on the corners. 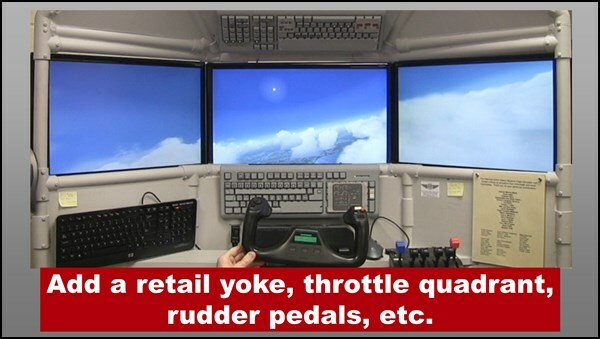 I use the Saitek Pro Flight Cessna Rudder Pedals, and I really like them, but they have to be positioned further away from the pilot. The rudder pedals attach to the Floor Boards with Velcro, but the original boards were too short. Therefore, I replaced them with two 1×6 boards, 22″ long. You might not need to make this change for your rudder pedals. I also raised the center stabilizer bar to allow room for the Saitek Pro Flight Cessna Rudder Pedals. Specifically, the back of my ankles banged into the stabilizer bar, so I had to move it. It is now 6.5″ higher than it was before. I now use self-drilling screws in everything I build. Back in 2010 when I designed this project, I used Liquid Nails Project Glue to attach all the PVC pipes and fittings. This allowed for some cost-savings, but self-drilling screws are far superior. The screws allow for a simpler assembly with no overnight dry time. In addition, the screws create a much stronger frame. Lastly, you can remove the screws later if you decide to modify the frame. 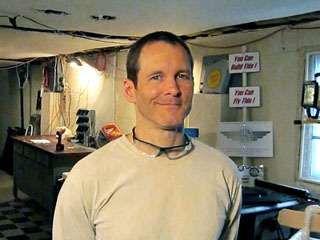 I absolutely recommend using 1/2″ self-drilling screws to build DIY Flight Sims from PVC pipe. Don’t fly thirsty! I include a cup holder with almost every project I design. The cup holder is located next to the throttle and it’s easy to find it, even when wearing a VR headset. I use these inexpensive cup holders from Amazon. 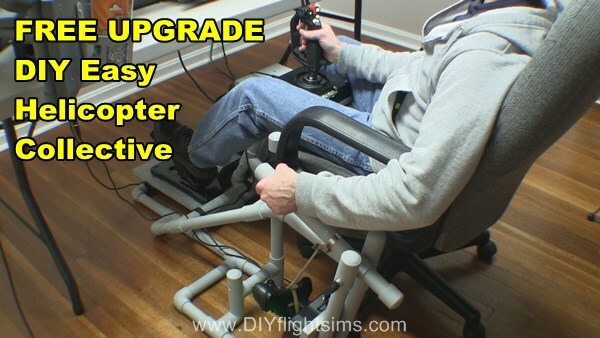 If you’ve already built the DIY Side Joystick Frame, Item F311, or if you haven’t built one yet, these 5 Modifications for a DIY HOTAS Chair can enhance your home flight simulator experience for years to come.